The first thing I taste from the surface of these pieces is a sweetness, followed by a significant smokiness. Some of the chipotle seasoning is lightly detectable. The chewing brings in the natural meat flavors, along with light garlic seasoning saltiness, while the chipotle seasoning becomes a little more defined. For being marketed as a "Chipotle" beef jerky, it seems to hold well. 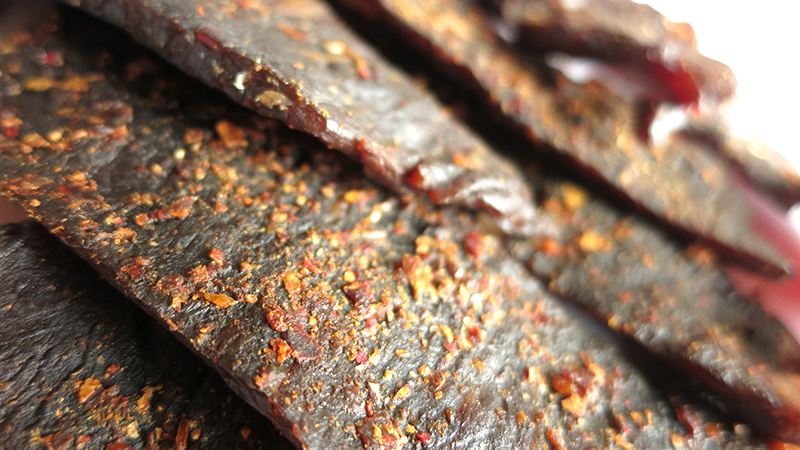 Chipotle is largely smoked chiles, commonly jalapenos, and this jerky seem to have that dried, smoked chile pepper flavor, though the smokiness seems to blend into the hickory wood smoke. The chipotle also generates a little bit of heat, what I would rank on my personal heat scale as "mild medium" (level 2 out of 5). Otherwise, the flavor that seems to define this jerky overall is the real hickory wood smoke and the natural meat flavor. There's actually an initial sweet that hits you first, and draws you in. There's also a garlic salt seasoning, where the garlic is faint and the saltiness is moderate. The ingredients seem to combine to create a very addicting flavor, focused on the old fashioned goodness of real wood smoked beef, with a well balance between sweet, salty, savory, and spicy. These are slices of whole meat, cut into thick slabs of small to medium sizes, with each slab big enough for one or two bites. This a semi-moist jerky with a dry surface feel, maybe a faint bit of stickiness. Chewing is easy, while tearing off a bite is easy as well. The chewing starts out feeling tender with a light bit of rubber character. After several chews, it breaks down into a meaty feel, with still rubbery chewing. But once chewed down to a soft mass, it feel like just like a steak cooked medium-rare. I see tiny flecks and streaks of fat on some pieces, perhaps enough to add a light marbleized flavor. Otherwise, I see no gristle or tendon. I encountered a light bit of stringiness, but don't really find any unchewable tissues. As for clean eating, it's mostly clean with scant bits of seasoning stuck to my fingers, enough to rub loose. 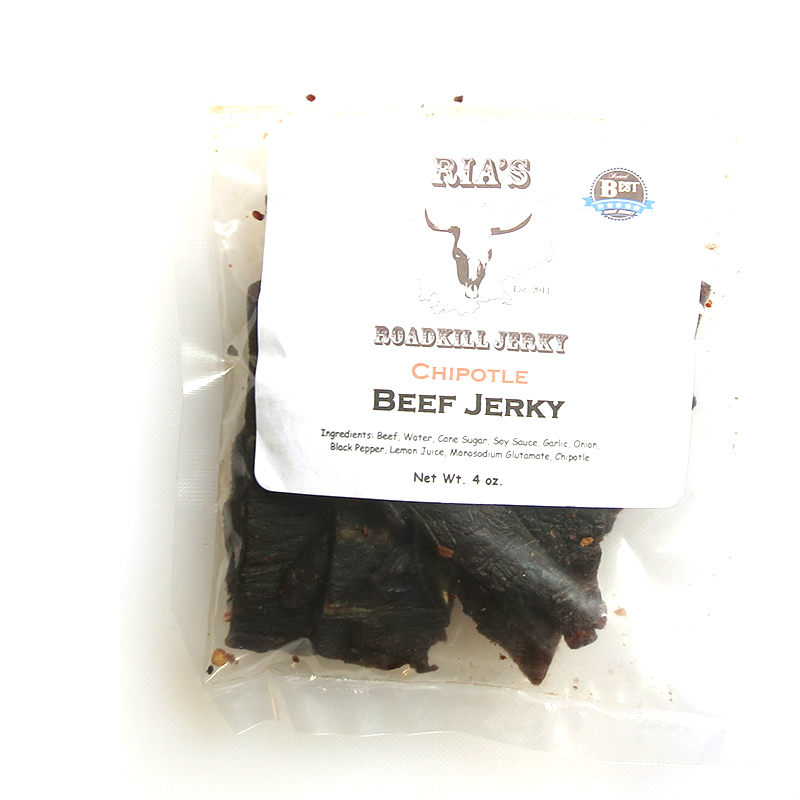 Ria's RoadKill Jerky sells this Chipotle beef jerky at a price of $7.99 for a 4oz package. You can buy four of their 8oz packages at a discounted price of $53.99. Shipping is free. That works out to a price of $1.69 per ounce. For general jerky snacking purposes, at the $1.69 per ounce price, this is an excellent value. Compared to other brands of jerky sold in stores, this has far better flavor, much better meat consistency, and much better chewing texture. You're basically paying bargain-bin prices for top-quality jerky. As a chipotle beef jerky, at the same $1.69 per ounce price, it's an excellent value. I get fair amount of chipotle flavor in most bites with a light amount of heat, perhaps as much as or more than leading national brands, yet still at a lower cost. 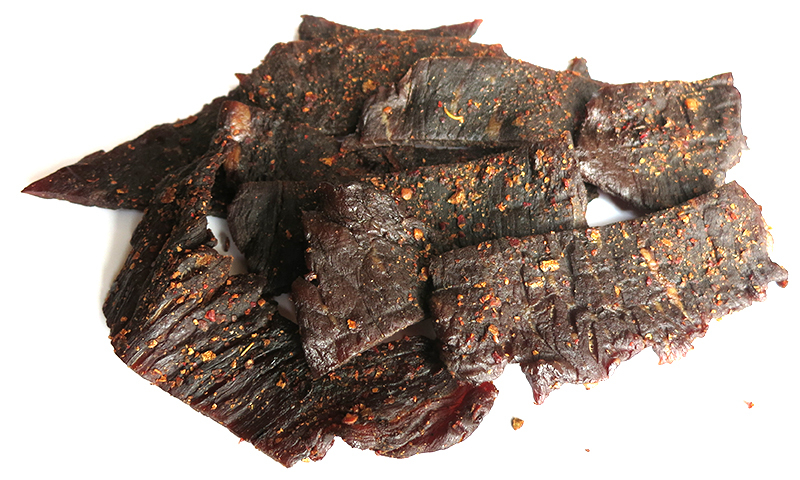 This Chipotle beef jerky from Ria's RoadKill Jerky is much like the Original variety, with a well-defined real hickory wood smoked, natural meat flavor, but with added chipotle seasoning. The chipotle comes through with just enough intensity to notice easily, and even generate a light bit of heat. Yet, it's the wonderful flavor of real hickory wood smoke and the natural flavor of beef that really makes this jerky win. Ultimately, this chipotle seasoning is really just to create a little extra flavor and kick to what is already a top-rated jerky. If you like Ria's Original beef jerky, but wanted to get a little more spice, this Chipotle may just be what you're looking for. The meat consistency is excellent, being of mostly all meat with small streaks of fat to create a more marbleized flavor. The chewing feels just like real pieces of steak. This is a one-two combination of excellent smoked beef flavor with excellent tender chewing.